« Hamlet, Why so serious ? Posted on September 28, 2008 under Ruby. I have been working on this small Rails based dashboard (code named : Fx Dashboard) the past few months. The basic idea that I had was to create some kind of a dashboard where I could collate all relevant financial information and news. The application has turned out pretty well, and I finally managed to put it online yesterday. 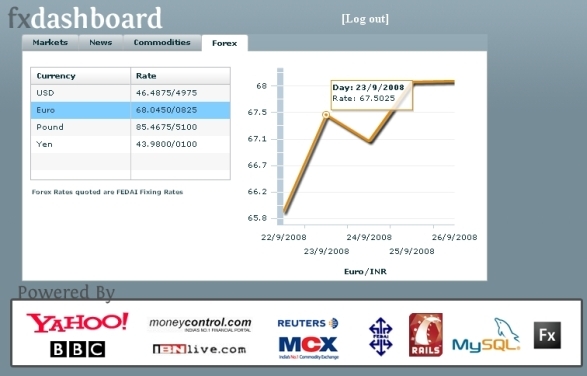 The application currently displays a 15 minute delayed feed of major market indices, delayed feeds of sub-indices on the BSE and the NSE, commodity prices from MCX, news feeds from IBN, Moneycontrol, BBC World and Reuters and the latest foreign exchange rates from FEDAI (see above screen shot). The only thing I haven’t been able to integrate as yet are the RBI rates. Building this application was a very learning experience.I learnt how to use Flex and integrate it with Rails. Also learnt what “screen scraping” is, and how to do it using Rails. As of now, this application is for personal use (might change in the future). Basically I want to test run it on a live server, see bandwidth usage etc. Lets see how it turns out. This entry was tagged under: programming, Rails. Both comments and pings are currently closed.